Kiribati consists of a collection of 33 islands and atolls in the Pacific. Its economy is based primarily on agriculture (copra), fishing and revenues from the sale of fishing licenses. It has a GNI per capita of US$2,520 (2012), but has seen relatively little GDP growth (1.4% per annum 2008-12). The economy is dominated by the agriculture and services sectors, with industry only contributing 9% of GDP (2010). Sustainable development has become the key objective in recent years due to the increased risk of flooding – 32 of 33 islands rise no higher than 2 metres above sea level. Kiribati has few natural resources and is one of the least developed Pacific Islands. The economy is driven by copra and fishing with tourism, remittances (1500 sailors), and some residual mining income from a trust fund. Remittances from seamen on merchant ships abroad account for more than US$5 million each year. Kiribati receives around $15 million annually for the government budget from an Australian trust fund and aid from the UK, Japan, China, Australia and New Zealand equates to almost 10% of GDP. In 2011 the direct contribution of travel and tourism to Kiribati’s GDP was 7.3%, generating 1,500 jobs – 6.2% of total employment (World Travel and Tourism estimate). The country markets itself as a remote destination, and an alternative to the modern, globalised commercial tourism industry. The main exports are copra (62%), coconuts, seaweed and fish; the main imports are foodstuffs, machinery and equipment, miscellaneous manufactured goods and fuel. Its main export destinations are Japan, Bangladesh, Europe and the USA. Imports were sourced mainly from Australia, Fiji, Japan and New Zealand. Economic development is constrained by a shortage of skilled workers, weak infrastructure, and remoteness from international markets. 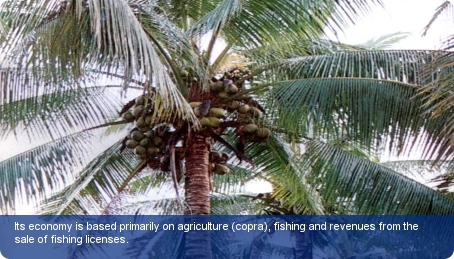 The major commercial activity is the harvesting of coconuts for the export of copra and seaweed production. Underemployment and unemployment levels are high in Kiribati, especially among the younger age groups. Historically the islands were a major source of phosphates but mining ceased in 1979 when the deposits had been mined out. Kiribati is ranked 115th overall for the ease of doing business in the World Bank’s ‘Doing Business 2012’ study. But it is ranked sixth in the world for paying taxes. These rankings measure the conduciveness of a regulatory regime in starting and operating a business. In a country of individual enterprises, subsistence lifestyles and small co-operatives, the Government of Kiribati is the largest employer in Kiribati. It employs around 4,500 staff, on top of the additional 2,000 staff working in public enterprises. I-Kiribati is the most popular language, with English being the national language. However it is not widely spoken outside the capital. Approximately 10% of the population is employed on salaries or wages, mainly in the public sector, whilst the rest are involved in subsistence fishing and farming or working on fishing vessels.